It’s easy for me to give my likes and dislikes but recently I was able to hear from some professional plantscapers and got their list. Here is the TOP 10 list of “Favorites” from: Clem Cirelli, Jr. General Manager of Summit Plants & Flowers, Inc., Springfield, NJ. His primary responsibility is for the interiorscape division, but also does all of the sales and design for Summit Plants, as well as overseeing the retail store. If you’re in the area make sure you check out Summit Plants and Flowers. As a professional Interiorscaper with years of experience Clem provides a quick look into why he likes these plants. We’ve provided links if available to these plants. An elegant single-trunk palm that might as well be made of plastic…it doesn’t twist its fronds, and it maintains its symmetrical shape…it’s easy to grow, and actually becomes BETTER LOOKING with time, is relatively pest-free (and even when the occasional mite or scale hops on board for a munch, nothing really bad happens to the plant)…it will do as well in fluorescent light as window light, and it doesn’t mind drying out. Its exotic, sculptural trunk and orange-tinted stalks make it truly One of a Kind! One of the Elite Aglaonema series, this plant looks great as an 8″, 10&”, 12″ or 14″ pot specimen, and with time can grow into a HUGE specimen. It seldom gets a yellow leaf, tolerates dry or moist soil even in dim offices and conference rooms, and has a naturally shapely growth habit. Combine these traits with its silvery-green-centered leaves and bushy habit, and you’ve got the ideal low-and-full floor plant for office conditions. Looks like a much-improved ‘Maria’ or ‘Emerald Beauty’ with its broad, silvery-green-marked, dark green foliage and mushroom-cap- shaped plant habit. This Aglo actually gets fuller and prettier as it ages! And it loves water! Great as a 6″ or 8″ plant, somewhat trickier to grow in a 10″ or larger container, but worth the effort. Just think: an Emerald Beauty that doesn’t get stalky 6 months after installation! This plant has been around for awhile longer than the above selections, but not commonly in the trade. It’s a narrow-leaved Cast Iron Plant of relatively diminutive stature (18-24″) that seems to be free of spider mites, unlike its more common plain- green and cream-striped cousins in the genus. The 2-3″ wide leaves are dusted with creamy white spots that make it light up in dark locations. I have had great success up-potting this into the next larger subirrigation container… and then stand back and watch it grow! A truly classic plant. Their close genetic relationship and similar appearance, these improved ‘Janet Craig’ types are great as canes or large bush forms. ‘Lisa’ has narrower foliage than either JC or ‘Michiko’ (sometimes looking like a wide-leaved, dark green Marginata after some time in low light situations) and tends not to spot as much as the other two cultivars. 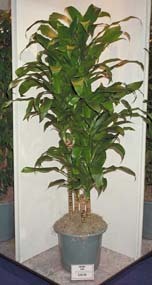 ‘Michiko’ looks like a plain green Dracaena fragrans with darker color and some lengthwise leaf corrugation. Great for narrow, low-light locations. A semi-dwarf peace lily that should replace S. wallissii. It resembles a more robust, fuller version of same, and tends not to spot and burn like wallissii. It also grows very full and lush in limited light conditions and gets better looking with time…a rare and cherished trait in the interiorscape plant pallette. Blooms come intermittently but regularly throughout the year, a bonus. 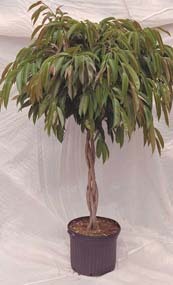 An improved benjamina type with wavy-edged foliage, a soft, weeping habit and mushroom-shaped caonopy. I have had these plants in less than 100 fc of light, behind closed verticals in offices where the occupants travel 50% of the time, and they just will not be held back! They get fuller, more graceful and more beautiful with age, and they shed VERY LITTLE, even initially. Love water, but tolerate dryish soil as well. Tend to get scale on their soft, new shoots, but Merit (and soon Marathon) takes care of that within a few weeks. An improved ‘Alii’ type, the broader foliage creates a very desirable fullness, and helps to camouflage any interior thinning that may occur after installation and acclimatization. One nice bonus: in high light, new growth is a shiny, mahogany red color. Sheds minimally, but does not like wet feet…you actually need to dry this off a bit, like a Rubber tree. Capable of weeping branches that reach the floor on a 14" x 6 ft. tree in 6-9 months from installation, if you go for that sort of thing! Not really a new variety, and I picked this as a representative of the group because of its exotic flower coloration: rose pink with a broad white picotee on the edges of the 1.5-2" diameter blooms! These "indoor" azaleas have broader leaves than northern-hardy types, have bloom life of 3-4 weeks in interiorscapes with adequate watering (use Oasis disks or such for best results on weekly schedules), and are true showstoppers whenever we have used them. Dark, medium and light pinks, purples, reds, whites, bicolors…you name it, Pac Northwest growers have them (as do some local growers in the Northeast and Midwest, if you’re lucky enough to find one). Try these in a post-Christmas or Mother’s Day rotation and wow your clients! What looks like a cycad, acts like a cast iron plant and will jazz up any interiorscape? "Z.Z. ", an aroid (philodendron/spath/aglo family member) originating in Zanzibar (how much more exotic can you get? ), its glossy compound leaves arching upward from the swollen base of the plant are sure to draw "what’s THAT???" comments from clients and visitors. Loves to get dry between waterings (the lore of this plant is rife with tales of three- month droughts cheerfully tolerated) and will give you a flexible, durable new piece of living sculpture to use in that "something different" account or location.